The Coach House is a stunning 4/5 bedroom old world home with beautiful exposed stone walls set on 0.77 acre site adjacent to Ballyhannon Castle. 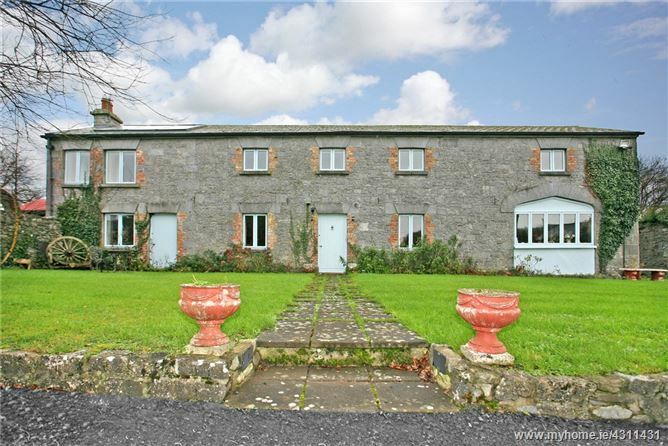 The property is a short distance from the M18 Dromoland interchange and Quin village. The former family home of the owners of Ballyhannon Castle, the Coach House is an amazing 19th century period house that was formerly the stables and carriage house for the 15th century castle. The castle is known locally as Castlefergus which still stands proudly and completely restored to its former glory across the courtyard. Under expert architectural supervision in 1995 the Coach House was converted by the previous owners into a quintessentially beautiful country family home retaining the wooden beamed ceilings upstairs and internal stone walls. It was also home to rock stars, as well as several American and British film stars during film making in the region in the 1990's, and of Irish and international celebrities and dignitaries who stayed there from 2004 and 2018 when the current owners rented it out as an upmarket vacation rental. The Coach House at Ballyhannon Castle is located close to Shannon International Airport for those travelling to Ireland from abroad, yet in a rural setting within its own territorial stone-walled perimeter surrounded by farmland, and overlooks the Shannon Estuary leading to the Atlantic Ocean. An ideal home, or business opportunity to continue to use it as a tourist property vacation rental / AirBnB like the current owners have been doing for 15 years. 212sqm (2282 sq.ft). BER G. BER No. 111392726. Living / Dining Room 4.64m x 10.04m. Generous living room space with exposed stone walls and a cast iron wood pellet stove at the heart of the property’s main living space. Conservatory 3.23m x 7.00m. West facing living area for afternoon and evening sun with curtained access to the main living room. Kitchen 4.64m x 4.78m. Includes a wood pellet stove and the access stairs to the first floor. Bedroom Ensuite / Living Room 4.64m x 4.39m. This ground floor room with shower-room/WC is just off the main living room and can be used as a living room, study or ensuite bedroom. Hall 1.05m x 15.5m. Beautiful hall connecting the landing to the master bedroom with a long stone feature wall and sky lights to illuminate the access to the rest of the bedrooms. Master Bedroom Ensuite 4.64m x 4.40m. This en-suite double room has exposed wooden-beamed ceilings and internal stone walls. Main Bathroom 3.30m x 2.15m. From the Dromoland M18 interchange (junction 11) take the L3148 road to Quin for 1.9km. Turn left where the road turns sharply to the right and go through the gateway. Follow the driveway to end. The Coach House gate is adjacent to the castle.